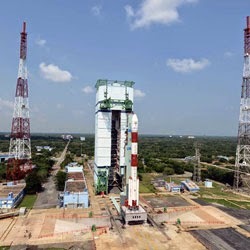 The Indian Space Research Organisation (ISRO) is looking forward to the lift-off of its Polar Satellite Launch Vehicle PSLV-C 23 from Sriharikota at 9-48 am on the coming Monday, the 30th June 2014. PSLV in its 27th flight will launch SPOT-7 a French earth observation satellite into a 655 km Sun Synchronous Orbit (SSO). PSLV will be launched from the first launch pad of Satish Dhawan Space Centre. This will be the 10th flight of PSLV without the use of solid strap-on motors. SPOT-7 is a French optical earth observation satellite. (This is identical to SPOT-6 launched earlier on-board PSLV-21 during September 2012). SPOT-7, after its injection into Sun Synchronous Orbit, will be phased and placed diametrically opposite to SPOT-6 and will form part of the existing earth observation constellation. SPOT-7 satellite is built by Airbus Defence & Space, a leading European space technology company. After more than 17 minutes of flight, the PSLV C23 will put SPOT-7 in the designated orbit. Along with SPOT-7, there will be 4 co-passenger satellites, AISAT from DLR, Germany, NLS7.1 & NLS7.2 from UTIAS/SFL, Canada and VELOX-1 from NTU, Singapore. AISAT’s mission objective is global sea-traffic monitoring system with special emphasis on high traffic zones using AIS signals. It is the first DLR Satellite in the nano-satellite class. NLS7.1 & NLS7.2 have been designed for sub-metre level accurate position control system. VELOX- has been designed as a technology demonstrator for in-house design of image sensor and inter-satellite RF link. The 44.4 meter tall PSLV weighs 230 tones and has four stages using solid and liquid propulsion systems alternately, solid propellant for its 1st & 3rd stages, liquid propellant for the 2nd & 4th stages. An Advanced Inertial Navigation System (AINS) developed by ISRO is being used in this flight. The reliability rate of PSLV has been superb. There had been 25 continuously successful flights of PSLV, till April 2014. With its variant configurations, PSLV has proved its multi-payload, multi-mission capability in a single launch and its geosynchronous launch capability. PSLV has rightfully earned the status of workhorse launch vehicle of ISRO.